To some people this may sound like mobile first but it is not. True, we live in a mobile driven generation, but that does not mean you have to put mobile first in the design and development progress. Look at the traffic stats of your product, are your mobile users really overruling the other users? Probably not, but if you think mobile first is the best approach for the ~12% of traffic on mobile devices be my guest. The problem today is there are so many small screened devices out there that mobile first sounds better and sells better. It is just sales slang ...In my personal and professional opinion the topic should be considered screen importance. 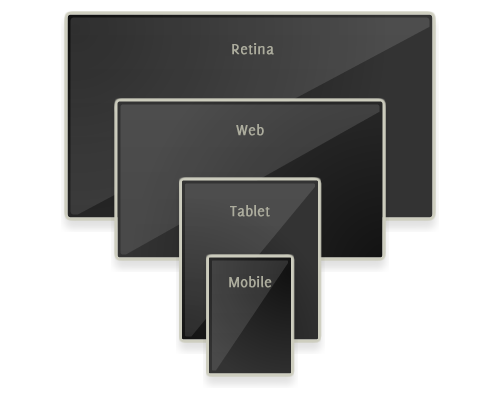 Since retina & internet tv dawned upon us, the mobile screen resolution is growing along with the increasing use of retina for displays. Basically there are 4 kinds of screens to care about now. Maybe you are a photographer, and you want to put retina first to show your work at in full quality. Whether you scale up or down, you still have to think about ways to make your content please the eye of the beholder on all screens of importance to you. Mobile phones are also growing towards tablet formats, so the discussion should not be just about the small screens. I would never put mobile first, ahead of strategy that is!